Cross-country (XC) skiing has long been one of the Outing Club’s most popular activities, with members participating in skate, classic, telemark, and backcountry skiing. If you do not own ski equipment, the Outing Club can provide you with telemark, classic, or skate XC gear. Poles, boots, and skis are free for use on any club trip. Regardless of your skill level, the Outing Club has trips for you. Experienced members can help you select the equipment that fits you, and then teach you how to use it. Outing Club ski trips usually have a mix of expert and beginner skiers, making instruction easy. 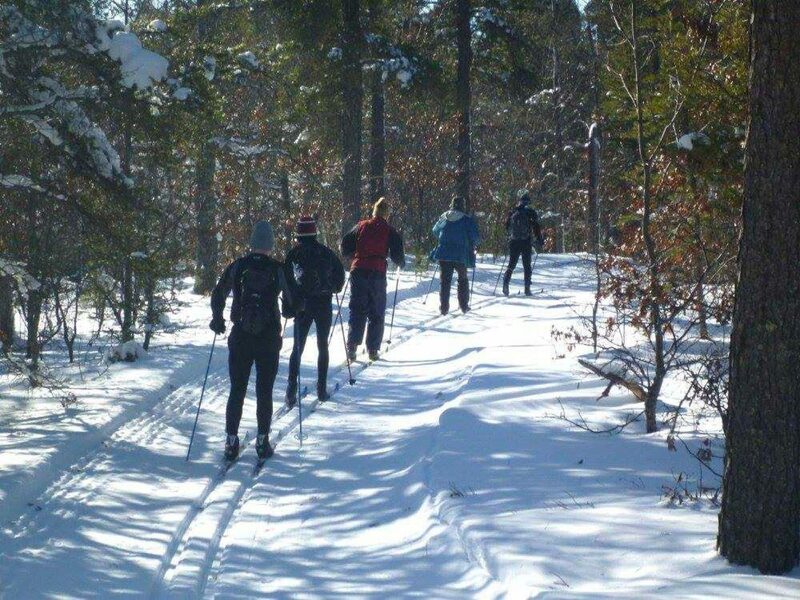 Every weekend during the winter (snow permitting), day trips go out to nearby cross-country ski areas such as Blue Mounds, Governor Dodge, Kettle Moraine, and Indian Lake. On weeknights, skate skiers can improve their skills on trips to Elver Park and other local courses. We even often go skiing right out on Lake Mendota! These inexpensive local trips are also an excellent way for inexperienced skiers to test the waters. Longer weekend or week long trips occur regularly. Winter camping trips to Michigan’s Upper Peninsula, Minnesota, Northern Wisconsin, and Ontario let hearty souls experience the wilds with out the crowds or bugs. Trips to Delta Lodge and the American Birkebeiner Ski Marathon are an annual tradition. Additionally, Outing Club hut-to-hut and yurt-to-yurt trips in the American West and Canada allow skiers to explore some of North America’s most interesting wildlands. Check out these other local XC resources! Skinnyski - news, trail reports, and more! For more information or to lead trips of your own, contact our Cross-Country Skiing Chair or other leaders. What clothing do I need to ski? Other than skis, boots, and poles, you’ll need non-cotton clothing than can be worn in layers. Wear clothes similar to what you would wear running outside- downhill ski or snowboard gear is too hot!